The topping on the cake was that we were able to have this adventure with The Domestic Man and family. We had a fantastic day cooking and playing with our cameras, as well as some ad hoc computer diagnostics (which is for another post). 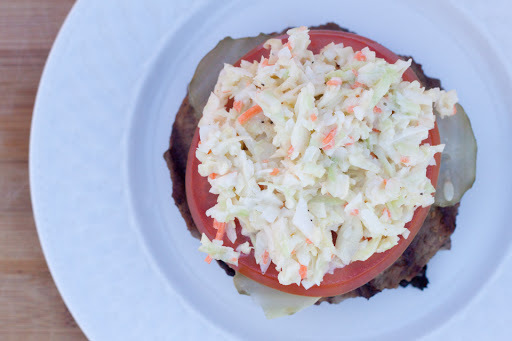 Russ was kind enough to take over our kitchen for the afternoon and come up with several tasty variations on the hamburger, one of which even included this cole slaw. That should be coming to an internet browser near you later this week, but in the mean time you should really pause and vote for his BBQ sauce here for Paleo Magazine’s best of the best. Trust me–this is a sauce you need in your life. Good on burgers, ribs, and we can’t wait to find out what next. 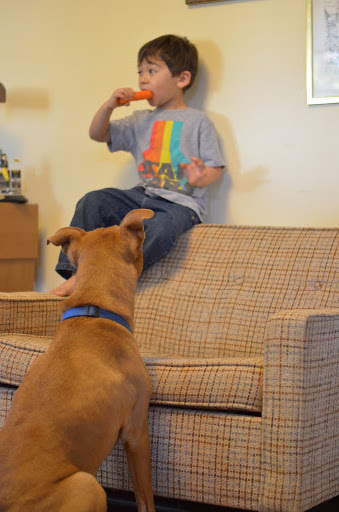 Be careful though, the dog may decide to be interested in the extra carrot. 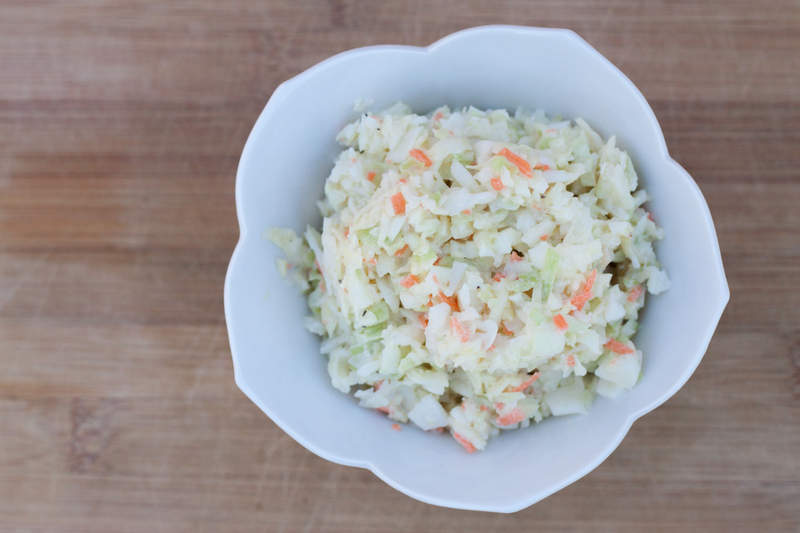 All that being said, here is our take on this famous cole slaw recipe. Time is a friend of this recipe, and we suggest preparing it and making it 24 hours before you plan to serve it. 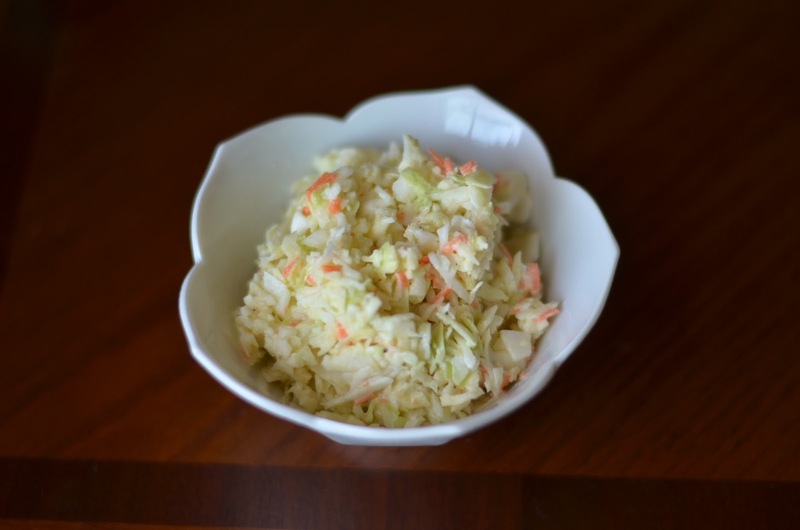 Prepare carrot and cabbage into finely minced pieces. For the carrot, I used our handy julienne peeler to start and for the cabbage our mandoline. I then minced both finely down to little pieces. Make your mayonnaise (food processor starting with egg, mustard, salt and pepper. Blend on high slowly adding the oil mixture 1 Tbsp at a time until finished) and add it to the mixture of cabbage and carrot. Add all other ingredients, and mix thoroughly. This is a little sweeter than the restaurant-chain style, but after a day it settles quite nicely. It worked well with burgers as well as a standalone. Many thanks to Russ for the additional pictures and the company. Be sure to check out his BBQ sauce, because it’s delicious. Also make sure to enter in our giveaway for a copy of Make it Paleo. The giveaway CLOSED November 26th. OMG… just bought myself a nice food processor as a Christmas present to myself, and this is the first thing I whipped up in it. Ab-so-lute-leeeee fabbbbbbulous!!! I’ve been dairy free for just over 2 months, and made the decision to go totally paleo first of the year… what a yummy start!! Lori, I’m so glad you enjoyed it! We missed this from our chain fried chicken restaurant, and we’re happy to have this instead. Congrats on your decision to make the switch, and keep it up. I know… “the Colonel” had the best slaw… this was a very, very pleasant surprise. This undoubtedly will be one I make time and again, and can bring as a side to family get togethers to share. oh my gosh!!! this is amazingly delicious!! !